Cantorion Rhos are commemorating the centenary of the 1918 Armistice with special concert, featuring Fauré, Requiem as well as readings of poetry by Wilfred Owen and Siegfried Sassoon, among others. We are joined by baritone Sam Snowden and organist Mervyn Cousins, the choir’s former Music Director. 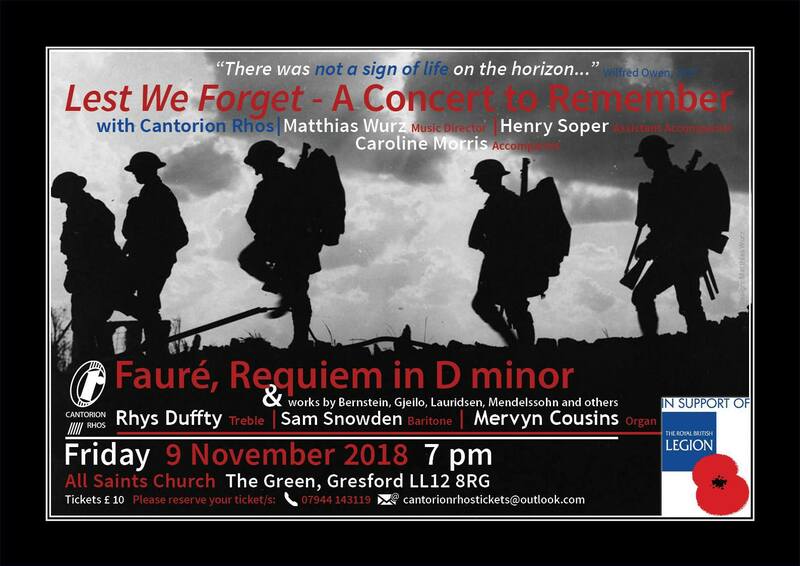 We are also pleased to announce that Rhys Duffty, a treble at Chester Cathedral, will be joining us and sing the enigmatic “Pie Jesu” in the Fauré, Requiem. The concert is in association with The Royal British Legion. Rhys started singing in primary school and then in 2013 sang in the choir at St Mary’s Church in Mold. In July 2015 he auditioned at Chester Cathedral and was accepted as a probationer and five months later he was made a full chorister. He has had the opportunity to sing many solos and in July 2018 he was awarded the cathedral prize for Boys Solo singing and from September 2018 sings as one of the Lead Choristers. With the choir he has had the opportunity to sing in many places, St Paul’s Cathedral, Liverpool Cathedral and as part of a Cathedral Choir tour in 2017 to Northumberland, in Durham and Carlisle Cathedrals among others. He has been involved in several Radio 3 broadcasts and in the recording of a CD which will be available in the autumn term. In July 2018 he entered the BBC Radio 2 Chorister of the Year. Since then, Rhys has been selected as reserve candidate alongside the three finalists. Rhys is in Year 8 at Abbey Gate College in Chester, where he was awarded a Choral scholarship, and is a member of the School Chapel Choir. In July 2018 the Chapel Choir were on tour in Cambridgeshire where they sang evensong at Ely cathedral and had the opportunity to sing in Kings College, Cambridge. Rhys is a keen musician playing the piano and trumpet and is interested in playing the organ. Recently he took his grade 4 singing gaining 98 marks out of 100. In his spare time, Rhys enjoys swimming and playing tennis and has represented his school in discus and javelin. He enjoys cooking and baking and is of particularly proud of his Welsh cakes! He has a 5-year-old black Labrador named Jet and his ambition is to become a vet. Samuel is a Welsh Bass-Baritone studying at the Royal Northern College of Music, under the tuition of Quentin Hayes, previously taught by world renowned composer Brian Hughes. Samuel participates in many college activities, as a member of the RNCM Chamber Choir, and taking to the stage as a chorus member in several productions by RNCM Opera, including Handel’s Theodora, Massenet’s Cendrillion and Humperdink’s Hansel and Gretel. Samuel is a well sought-after soloist, performing in venues across Wales. Recently he has performed Faure’s requiem, Stainer’s Crucifixion and joined Wrexham Symphony Orchestra for their performance of Nielsen’s Third Symphony, Sinfonia Espasiva. Samuel is a regular soloist with Welsh male voice choir, Johns’ Boys, conducted by award winning conductor Aled Philips, taking to the stage across the United Kingdom, including Rhosllanerchrugog, Manchester and Llandudno’s Venue Cymru, for the Daily Post Christmas Special. Samuel regularly appears on television, including five performances at the BBC Proms (BBC2 and BBC4). For the past two years he has appeared on ITV’s Carols at Christmas, broadcast on Christmas Eve. Samuel has competed, with Johns’ Boys, in several competitions broadcast on national television, Cor Cymru on S4C, Llangollen Eisteddfod’s Choir of the World, S4C, and Choir of the Year on BBC4. Samuel has had the pleasure of performing premier works by some of the world’s greatest composers. As a member of the National Youth Choir of Wales, Samuel premiered Edward Greggson’s Three John Donne settings, Paul Mealor’s Sound and Sweet Airs, composed for the National Youth Choir’s tour of Patagonia, and Mealor’s Wrth Ddŵr a Thân, premiered at the Royal Opening of the National Assembly of Wales in the presence of her majesty the Queen, the Duke of Edinburgh and Prince Charles. Samuel has also had the pleasure of premiering a major work by Karl Jenkins, the most performed living classical composer, Adiemus Colores at the International Eisteddfod in Llangollen, conducted by Jenkins himself. Outside of singing, Samuel has also developed a passion for conducting, becoming assistant musical director of St Joseph’s Catholic and Anglican Wind Ensemble, before forming a children’s choir in his local village, Gresford. At the Royal Northern College of Music, Samuel has formed a chamber choir, Aurora Vocalis, made up of singers from the RNCM. Samuel is delighted to be performing with Cantorion Rhos once again, as it always as pleasure to perform in his home town. 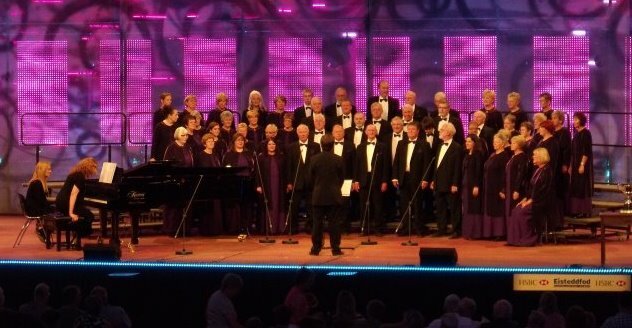 After posts as Director of Music at St Edmundsbury and Liverpool Metropolitan Cathedrals, Mervyn Cousins moved to Wales to join the staff of the world-renowned Llangollen International Musical Eisteddfod in September 2003. Initially taking up the role of Music Director, he was appointed as its Executive Director in 2008. Having moved from the Llangollen festival after the 2011 Eisteddfod, Mervyn combined regular concert and other musical engagements, and outreach work for Mid Wales Opera, with increasing amounts of music examining at home and abroad for ABRSM. He was subsequently appointed as its Deputy Chief Examiner in November 2015 and now spends much of his time working from its headquarters in the city of London. His work as an examiner, choral director and organist has taken him to many countries, and his recordings and broadcasts with the two cathedral choirs were met with critical acclaim. Mervyn was the Director of Cantorion Rhos from 2004 to 2009, leading the mixed choir to success in several competitive festivals and on its first overseas concert tour to Poland, and he is delighted to maintain regular contact with the choir. He is an Honorary Fellow of Glyndŵr University. Is it possible to reserve 1 ticket for your Friday 9th November concert in Gresford Church? Stan Moore mentioned this to me when he gave a talk recently n Mold. Yes, we will reserve a ticket for you.